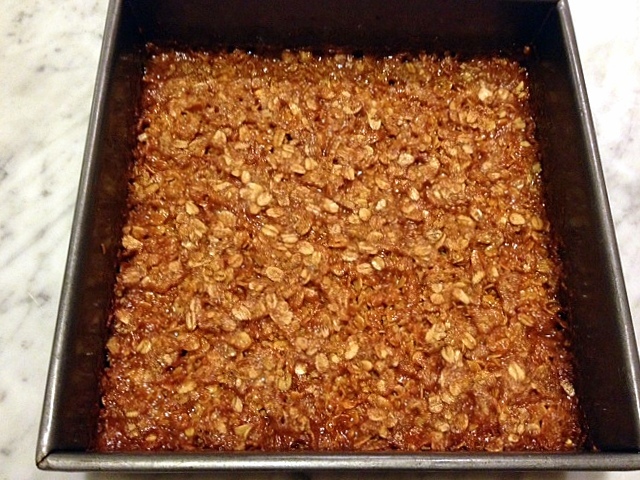 A Cake Bakes in Brooklyn: Scotch Teas - The Original Granola Bar? 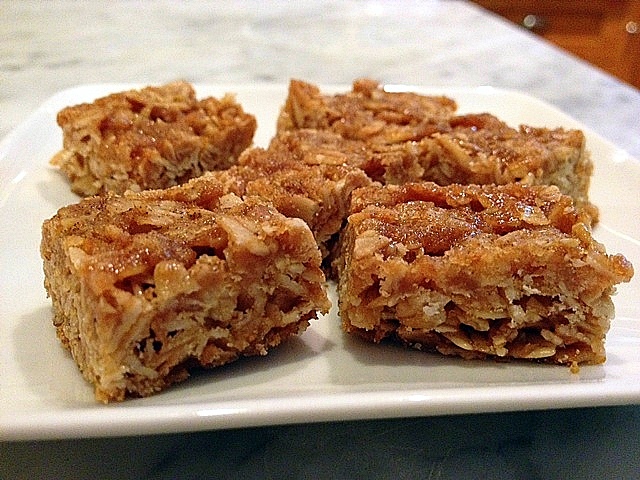 Scotch Teas - The Original Granola Bar? 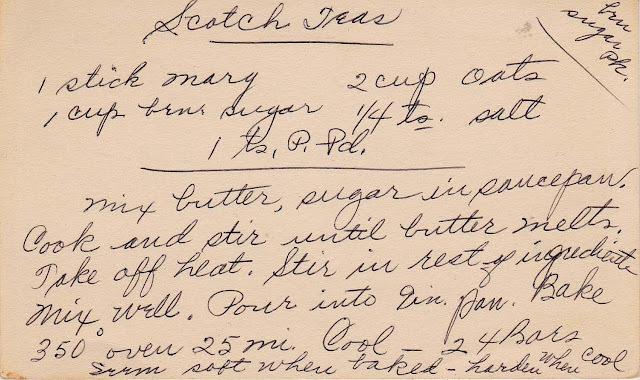 In all my years of baking, I've never come across a simpler or quicker baked good than Scotch Teas. They literally took less than five minutes to prepare. Plus, they are really, really good, putting to rest the misconception that scratch baking is always time-consuming and the broader notion that an excellent result requires a substantial time-and-effort investment. At 11 p.m. Tuesday night, I suddenly realized that the meeting I wanted to bake something for was happening at 10 a.m. the next morning. A quick shuffle through my recipe cards yielded this gem -- these are reminiscent of granola bars, though when it was written in the 1940s, these snacks did not exist. 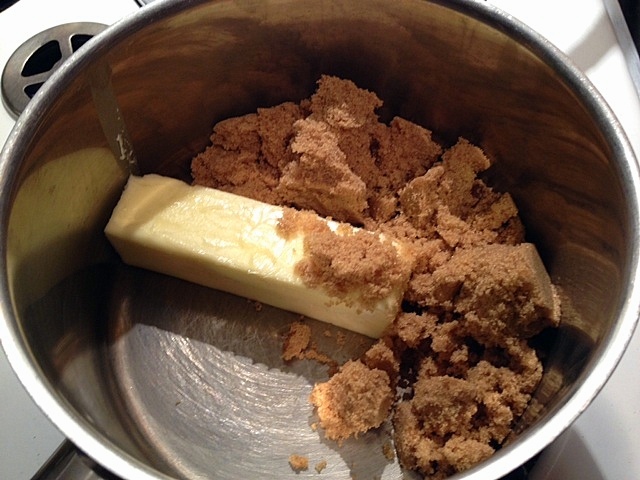 So, if you have five minutes (plus 25 for baking), begin by melting the butter and sugar in a saucepan. 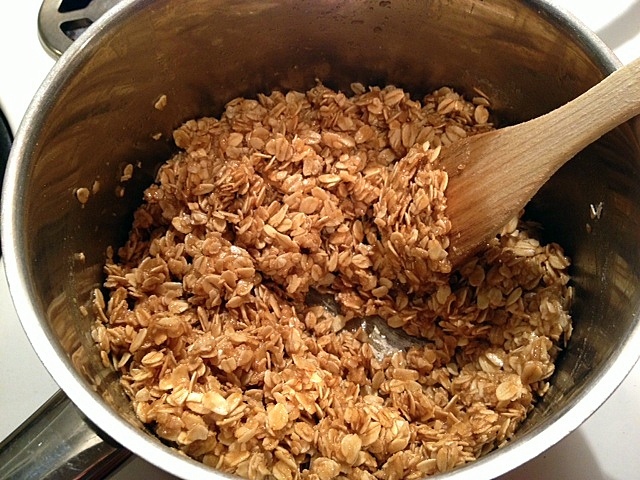 Stir in the oats, salt and baking powder and combine. Put the mixture in a greased baking pan. This is the most challenging part. Use an offset spatula or the back of a spoon to spread it evenly. Pop it into the oven. And voila! 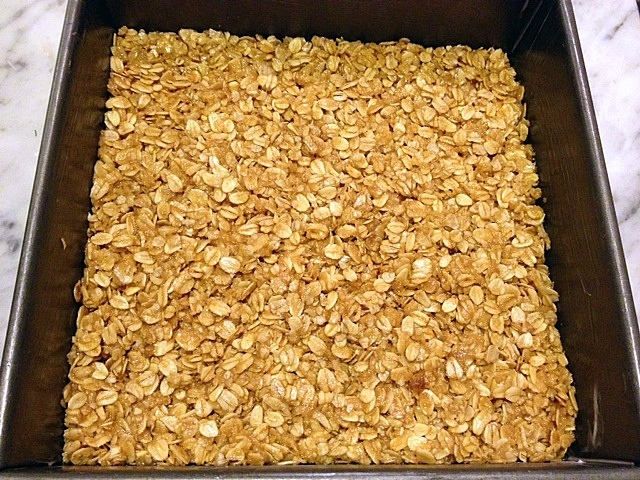 Homemade granola bars. Let it cool and cut it into bars. Next time, I'll line the pan with parchment, with the paper overlapping the sides to be used as a sling to remove the entire confection from the pan. I used butter, not margarine, and regular (not quick cooking) oats. Be sure to pack the brown sugar. 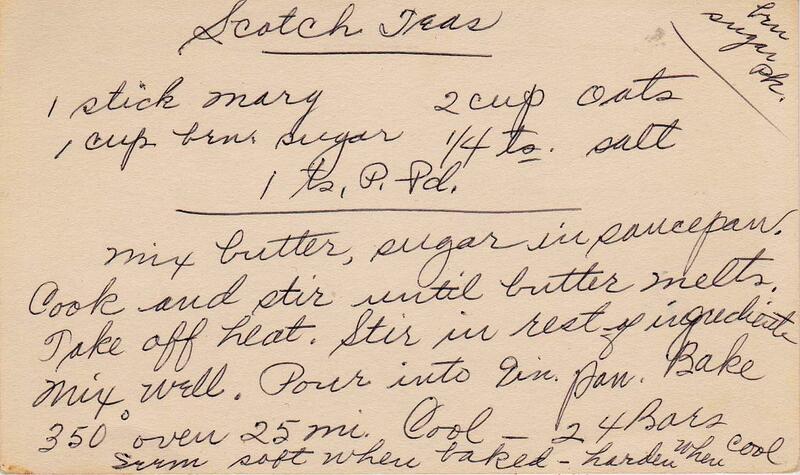 I am always impressed at how y'all antique recipe collectors can decode these old cards. I would never look at "1 ts. p. pd." and figure that was supposed to mean baking powder. Isn't this what is called "flapjack" in Great Britain? I've made something like this only I think there was 1 more ingredient. It was good but then I "went on a diet", and never made them again. Oh man Why did I search the internet for yummy goodness. If I make these again, I would maybe reduce the fat... shifty eyed glance.